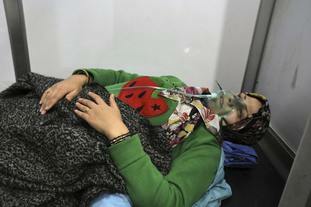 Syrian warplanes have attacked rebel-held areas in northern Syria for the first time. The attacks come as Syrian officials said more than 100 people were treated at hospitals following a suspected poison gas attack by rebels in the northern city of Aleppo. The latest wave of shelling and air strikes in northern Syria is the most serious violation of a truce reached by Russia and Turkey that brought relative calm to the country’s north for the past two months. The British-based Syrian Observatory for Human Rights and the Thiqa News Agency, an activist collective, said government warplanes pounded rebel-held areas west and south of Aleppo city. The air strikes were the first since the truce went into effect on September 17. Syria’s Arab News Agency, SANA, said the alleged chemical attack late on Saturday was carried out by “terrorist groups positioned in Aleppo countryside” that fired shells containing toxic gases on three neighbourhoods in Syria’s largest city. Russian Defence Ministry spokesman Major General Igor Konashenkov said Russian chemical weapons specialists have been dispatched to Aleppo. Russia is a close ally of President Bashar Assad and has intervened in recent years to turn the tide of the civil war in his favour. "According to preliminary data, particularly the symptoms shown by the victims, the shells that bombarded residential areas of Aleppo were filled with chlorine gas,” Mr Konashenkov said. The Observatory, which relies on a network of activists and contacts throughout Syria, said the air strikes hit the Rashideen district on the western outskirts of Aleppo and the village of Khan Touman south of the city. The truce brokered by Russia and Turkey, which supports the rebels, has been repeatedly violated, but until Sunday there had been no air strikes. Syrian state media, meanwhile, reported that rebels shelled the Christian village of Mahradeh in northwestern Syria, causing material damage but no casualties.